Liczba stron: 141 Jest to ujednolicona liczba stron, która ułatwi Ci porównanie długości książek. Każda strona Legimi to 200 słów. "The Cane Corso is one of the world’s most distinguished breeds...every page is overflowing with passion for our beloved breed!" J. Gould, Baltimore, MD "Very breed-specific to the Cane Corso - it's become my trusted "Bible." Stephanie Petron, Hampshire, UK "Amazingly detailed and the photography is stunning!" J Sarducci, San Francisco "Incredibly relevant Cane Corso tips and the history is a really welcome part of the Cane Corso Bible." 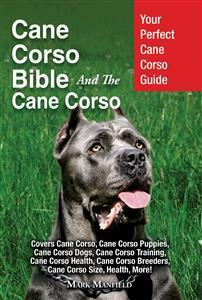 - S. Shepherd, Charlotte, NC.Cane Corso Bible And The Cane Corso is your definitive Cane Corso Bible! Everything is covered: from Cane Corso Puppies, Cane Corso Breeders, Cane Corso Variations including Brindle Cane Corso, Black Cane Corso, Blue Cane Corso, Formentino Cane Corso, Cane Corso Training, bringing your Cane Corso home, Cane Corso Dogs as Adults, Cane Corso Health & Nutrition, Cane Corso Temperament, and all the proven INSIDER TIPS you’ll need to have the very best life with your Cane Corso!This one-stop resource will help you to care for, train, & build a successful partnership with your Cane Corso, & makes a great gift for new ownersCanine author Mark Manfield has produced the most in-depth & up-to-date book yet on the Cane Corso. The 142 pages are easy to read & packed full of practical info & breeders' tips on everything you need to know about getting to know, caring for & living with the magnificent Cane Corso! Everything is Covered – including:Cane Corso Puppies – You’ll Learn:	How to prepare Your Home & Yard	What to do when Your Puppy first arrives	Cane Corso Sleeping Arrangements	Getting through the first week	Exercise – how much and what type? Crate training for your Cane Corso	Housetraining	Socialization – what does it mean and how to do it right	Training & Obedience	How to Avoid the missteps which could make Your Cane Corso’s personality not turn out right.Cane Corso Bible and the Cane Coro is full of tried-and-tested personalized advice on what to expect & all aspects of life with your Cane Corso, from bringing home your puppy home & into a thriving adulthood!For anyone who hasn’t chosen their Cane Corso yet there is:	Cane Corso variations & color patterns	Cane Corso hybrids and how to tell purebred from mixes	The Personality of the Cane Corso vs Other Competing Breeds	Cane Corso Breeders- What to look for (and to AVOID!). Where NOT to Buy a Cane Corso	How to Pick a Healthy Cane Corso Puppy or Cane Corso Adult	Temperament: Quickly understanding the Temperament of the exact Cane Corso You’re considering	Cane Corso Socialization Preventing Anti-Social BehaviorLearn about Cane Corso Food- What breeders recommend, Feeding Puppies, Raw Diets, Avoiding Food Allergies, Understanding Dog Food Labels, & Feeding Tips.In Depth- Cane Corso Health: including Ears, Skin, Allergies, Spaying, Neutering, Vaccinations, Preventing Fleas & Microchipping, Cane Corso common illnesses- and how to avoid them!Renowned world expert advice on the Cane Corso including from the Italian breed standards from the official society. Grooming & caring for the Cane Corso coat & skin, and the BEST actvities to make them shine!PS: This is not a run-of-the-mill book… it's for true Cane Corso lovers- full of real world advice on how to make the most of Your Cane Corso’s life and journey together! ALL RIGHTS RESERVED. This book contains material protected under International & Federal Copyright Laws & Treaties. Any unauthorized reprint or use of this material is strictly prohibited. No part of this book may be reproduced or transmitted in any form or by any means, electronic, mechanical, or otherwise, including photocopying or recording, or by any information storage or retrieval system without express written permission from the author. Published by DYM Worldwide Publishers, 2017. Copyright and Trademarks. This publication is Copyright 2017 by DYM Worldwide Publishers. All products, publications, software, and services mentioned and recommended in this publication are protected by trademarks. In such instance, all trademarks & copyright belonging to the respective owners. All rights reserved. No part of this book may be reproduced or transferred in any form or by any means, graphic, electronic, or mechanical, including but not limited to photocopying, recording, taping, scanning, or by any information storage retrieval system, without the written permission of the author. Pictures used in this book are royalty free pictures purchased from stock photo websites with full rights for use within this work. Disclaimer and Legal Notice. This product is not legal or medical advice and should not be interpreted in that manner. You need to do your own due diligence to determine if the content of this product is right for you. The author, publisher, distributors, and or/affiliates of this product are not liable for any damages or losses associated with the content in this product. While every attempt has been made to verify the information shared in this publication, neither the author, publisher, distributors, and/or affiliates assume any responsibility for errors, omissions, or contrary interpretation of the subject matter herein. Any perceived slights to any specific person(s) or organization(s) are purely unintentional. We have no control over the nature, content, and availability of the websites listed in this book. The inclusion of any website links does not necessarily imply a recommendation or endorse the views expressed within them. DYM Worldwide Publishers take no responsibility for, and will not be liable for, the websites being temporary or being removed from the Internet. The accuracy and completeness of the information provided herein, and opinions stated herein are not guaranteed or warranted to produce any particular results, and the advice or strategies, contained herein may not be suitable for every individual. The author, publisher, distributors, and/or affiliates shall not be liable for any loss incurred as a consequence of the use and application, directly or indirectly of any information presented in this work. This publication is designed to provide information regarding the subject matter covered. The information included in this book has been compiled to give an overview of the topics covered. The information contained in this book has been compiled to provide an overview of the subject. It is not intended as medical advice and should not be construed as such. For a firm diagnosis of any medical conditions, you should consult a doctor or veterinarian (as related to animal health). The writer, publisher, distributors, and/or affiliates of this work are not responsible for any damages or negative consequences following any of the treatments or methods highlighted in this book. Website links are for informational purposes only and should not be seen as a personal endorsement; the same applies to any products or services mentioned in this work. The reader should also be aware that although the web links included were correct at the time of writing they may become out of date in the future. Any pricing or currency exchange rate information was accurate at the time of writing but may become out of date in the future. The Author, Publisher, distributors, and/or affiliates assume no responsibility for pricing and currency exchange rates mentioned within this work. Chapter 1 – Cane Corso History: How Did the Breed Emerge? World War II: What Led to the Cane Corso’s Decline? What is the Modern Cane Corso? What is the Giant Cane Corso or King Corso? Chapter 2 – What Modern Role Does the Cane Corso Fulfill? What are the Benefits of Getting a Cane Corso? How Much Space Does a Cane Corso Need? Cane Corso and Your Kids: Will It Be a Good Fit? What are Cane Corso Faults? American Cane Corso Standard: How Do They Differ from the Italian Standards? What are the Non-Standard Colors of the Cane Corso? Chapter 5 – Cane Corso vs. Other Breeds: What Makes the Cane Corso Breed Unique? Chapter 6 – Cane Corso Puppies to Adults: How Can I Ensure a Smooth Transition? Is The Cane Corso Affectionate? What are King Corso Puppies? Cane Corso Puppy’s Temperament: What Qualities Should I Expect? Chapter 7 – How Do I Prepare My Home for a Cane Corso? Chapter 8 – Cane Corso Food and Nutrition: What’s Important? Chapter 9 – What are Some of the Common Health Problems of a Cane Corso and How Can I Avoid Them? Chapter 10 – How Do I Train My Cane Corso? What are the Common Behavioral Problems of Your Cane Corso? What Is the Importance of Socialization For Your Cane Corso? Chapter 11 – What is the Proper Grooming Routine for My Cane Corso? Chapter 12 – Cane Corso Dogs for Sale: What Should I Look For? Should I Buy a Puppy or a Full-Grown Dog? How Much Does a Cane Corso Cost? Chapter 13 — Breeding & the Cane Corso: What Should I Consider? What is Unique About the Female Cane Corso’s Temperament? What is Unique About the Male Cane Corso’s Temperament? What is the Life Expectancy of a Cane Corso? How Do I Show My Cane Corso? Chapter 15 — What are the Controversies Surrounding the Cane Corso Breed? Is the Cane Corso an Aggressive Breed? What Can I Do to Ensure a Good Experience? If you’re thinking of raising a Cane Corso (pronounced as “Kah-Naye Kor-so”), then you can look forward to having a special relationship with one of the most imposing breeds of dogs. It has a strong musculature that is regal and telling of its potentials. When properly trained, it can be a very able protector, guardian, hunter and work dog. Cane Corsos are keen and intelligent animals and as an experienced owner, having them around is always a rewarding experience. The Cane Corso, otherwise known as the Italian Mastiff, was originally bred in Italy. Its legacy stretches back to ancient times, to the realm of ancient Roman conquerors, battlefields, and farmlands. True to its alternative name, this breed has the look of a mastiff. Its large head is its most prominent feature. It also has floppy ears hanging just below the eyes, which can be cropped for a more proud and standoffish look. As with deciding any purchase that requires a long-term commitment, you must take into consideration certain aspects like your living arrangements and expenses, as well as your personality and needs, to know if a Cane Corso is the best kind of breed for you to raise. It takes a special kind of owner to meet a Cane Corso’s needs. Indeed, the Cane Corso is not for the weak of heart. This breed can be quite dominant and has a strong sense of hierarchy. It has a rambunctious nature that can potentially wreak havoc in your surroundings. That’s why you need to have a firm grip and control, and exude intelligence and self-confidence, for this breed to reach its fullest potential. And if you do your best, you will have a companion that displays nearly human-like qualities. With its bulk, size, and power, it has been known as a protector of the family. Through responsible care, Cane Corsos grow up to be gentle giants that are extremely loyal to their owners. The breed has even been known to save family members in times of peril. It is not unusual to hear of Cane Corsos doing heroic acts. As a matter of fact, the Cane Corso ranks 7th among all dog breeds when it comes to saving lives. Apart from this, the breed has an affectionate side for children. But unlike other breeds, they tend to be quite shy around kids; they give them a lot of space, only overseeing them from afar with a protective concern. With a Cane Corso around, you know the kids will be in good hands. This breed is also a great companion for whatever activity you have because of its dual personality. Not only can they keep up with all your outdoor activities, but they can also tame themselves when you need silence and contemplation. Cane Corsos are keen and intelligent animals and as an experienced owner, having them around is always a rewarding experience. They are very trainable—they can easily try new activities and can be taught many tricks. They even outdo other mastiffs when it comes to athleticism, agility, speed, and sense of adventure. So, are you now excited to raise a Cane Corso? This book will help you delve deeper into the standards and specifications of this breed. You will also get a historical look at the breed’s lineage and amazing comeback in the modern world, for you to further appreciate its nature and personality. Furthermore, you will be able to pick up valuable information on diet, nutrition, and supplies, and even ways to find a reputable breeder! There will also be comparisons with other breeds, and a tell-all of the benefits and pitfalls of owning a Cane Corso--everything to help you become the proud owner of a breed that has one of the most enduring legacies in the world. Cane Corso History: How Did the Breed Emerge? The Mastiff refers to a group of giant dogs with various breed types, supposedly originating from Asia. Ancient Chinese references show of the existence of Mastiffs way back in 1121 B.C. The existence of Mastiffs in Egypt in 3000 B.C. was also established with the discovery of hieroglyphics of Mastiff-like dogs. The Cane Corso is a type of Mastiff and typically shares the characteristics and history of this type. However, today’s Mastiff breed have roots from the Old English Mastiff, which were bred in England and were originally employed by their masters to fight off wolves and to guard property from ancient times. Quite significantly, the Mastiffs caught Julius Caesar’s attention in 55 B.C. during his invasion of Britain. He described the dogs as having fought bravely beside their English owners. The Cane Corso has a history that dates back to ancient Roman times. It has roots from the Roman war dog of the first century called the Canis Pugnax. During that period, the Cane Corso fought in ancient Roman battlefields together with legionaries of the Roman Empire. It served as a shield and protector of the warriors on the battlefield. Also, it has a reputation as a tenacious fighter in the gladiator arena, fighting humans, lions, tigers and other animals of the wild. But when the Roman Empire saw its fall, the Cane Corso found a new purpose. It was realized that it could be just as at home in the pastoral setting, as it was on the battlefield. The Cane Corso became a reputable companion, protector and work dog for the Italians. The breed was used as a cattle driver, carrying heavy animals to the market or slaughterhouses. It also protected properties against thieves and animal predators. In those times in the countryside, the Cane Corso was often chained to guard the stabled livestock, only allowing it a certain free range of motion. This was to protect bystanders and passersby and to keep confrontational dogs apart. After all, the Cane Corso still preserved its vicious war dog nature. The collar of the Cane Corso was often decorated with the family coat of arms. The breed was also often seen traveling alongside carts and stagecoaches, protecting the owners and contents from thieves and other attackers. With its instinct to protect, the Cane Corso earned the name Cohors, which means Guardian or Protector in Latin. The Cane Corso was also used as a flock guardian to drive wolves away. It was equipped with a special collar to give it an advantage over wolves. Aside from that, the Cane Corso had a role in keeping animals under control, particularly in the breeding of swine. When a sow hides in a thicket to protect its young, the Cane Corso sniffs out the location, then gradually attacks and incapacitates it by biting its ear or snout. Then at the signal of the farmer, the dog releases the sow so the farmer can safely gather the litter. Furthermore, the Cane Corso was indispensable for hunting wild boars, which were then endemic to the Italian countryside. When the boar began to attack with its dangerous tusks, the danger was very real. The Cane Corso, ever vigilant, would leap to the rescue of its master when this happened. Back then, wild boars were also an important food source, along with badgers and porcupines, which are all native to the Italian countryside. Cane Corsos were often organized in packs to specifically hunt these wild animals.